It looks like the temperatures and snow – natural and manmade – is falling just in time for a wonderful Northeast winter! At Gore Mountain in North Creek, you can explore New York’s biggest ski area with 14 lifts, 109 trails, 2,537-foot vertical drop, and 440 skiable acres. Terrain is 10% beginner, 50% intermediate and 40% expert, 21 glades, and 97% snowmaking coverage. They have a fun lineup of events, promotions and other happenings, including “Why Not Wednesdays” for $48 lift ticket on non-holidays when you bring any unopened Coca-Cola product. Gore has Christmas, MLK and President’s holiday camps for kids. Many ski/ride clinics for women, Telemark skiing, master the mountain and glades. And a variety of races: snowshoeing, NYSEF, boarder/skier cross, restaurant race, mini-shredders jibfest, log jam, and new Irish spirit race. There are a variety of mountain services including day care, ski demos, massage in the lodge and recreational racing. The Snow Sports School has coaching and lessons for skiers and snowboarders of all ages and ability levels, with daily lessons for kids ages four-12, first-timers ages 13-plus, private and group lessons, six-week and season-long mountain adventure programs for kids – and separate programs for ages 13-15, and adaptive lessons. You can save money with their Snow Sampler four-packs, frequent skier cards, eTickets, season passes, lift/lodging packages and gift cards. For a great ski experience, rediscover Whiteface in Wilmington, the number two ranked ski resort in the Eastern U.S. (SKI magazine). Whiteface is home to the greatest vertical drop east of the Rockies, with 86 trails stretching over 22 miles, and encompassing three peaks. The lower mountain is a safe learning environment for beginners, mid-mountain has lots of options for the family, and of course, spectacular and varied expert terrain – including The Slides. Then, add the excitement of the Olympic venues in Lake Placid, and you’ve got a fun, vibrant ski day or vacation. Upcoming events include Santas Ski Free Day on December 11 (must arrive by 10am), World Cup Freestyle moguls competition on Jan 13, and World Cup Freestyle aerials at the Olympic Jumping Complex on January 14. Lessons and programs include just for kids, group and private lessons, Snowboomer Social Ski Club for 50-plus alpine skiers – and Nordic skiers at Mt. Van Hoevenberg, NY Ski Education Foundation athlete training, and Without Limits adaptive ski program for all ages and skiing/riding abilities. 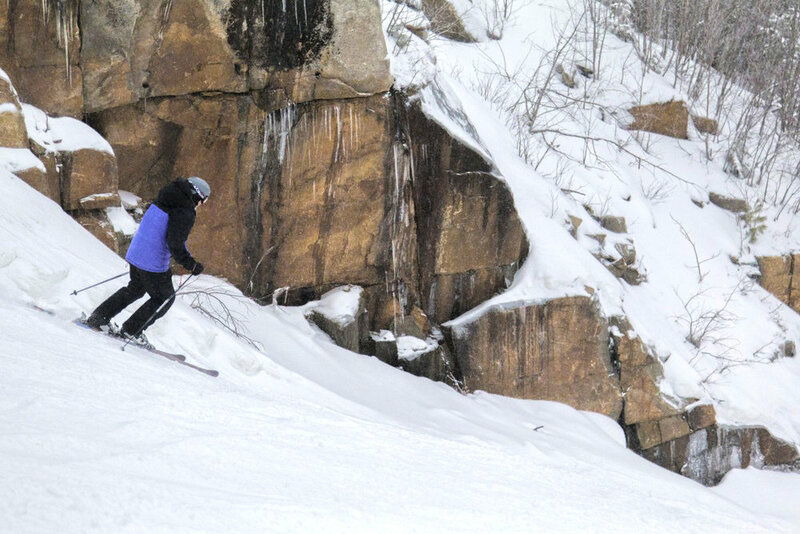 In Queensbury, West Mountain is conveniently located three miles off exit 18, they offer skiing, tubing, lessons, alpine and freestyle and ride teams, and awesome terrain parks. With views of the Hudson River and Adirondacks, West has been a perfect setting for family winter outings for over 50 years. As of 2013, West’s new management has been dedicated to investments and upgrades that have been well received. There are 30 trails with 125 acres ranging from gentle learning slopes to challenging terrain. Their snowmaking and grooming crew covers 80% of terrain in snowmaking. The opening day bash is on December 16 with 8pm fireworks, ticket specials, live music and bonfire. The new West Mountain Sports rental and tuning pro shop is now open for tuning. They have six-week lesson programs, holiday camps, and Super Seniors and Friday Ladies programs. The West Mountain Racing team offers academy-like training at reasonable rates with full, midweek and core day training membership. The Intro to Racing six-week program starts January 10 for all mountain skiers, ages six to 14, with no previous race experience required – and a Winter Break four-day camp meets on President’s Week. WMR’s new Snowboard and Freeski program, headed by former Killington Mountain School coach Matt Lynn, has full and midweek programs for ages 7 and older. Visit westmtn.net. Just east of Saratoga County, Willard Mountain in Easton is New York’s coolest little ski area. They have 100% snowmaking, night skiing and riding, a full-service ski shop, terrain park, and tubing park. Their ski school offers lesson programs for groups or individuals of all ages. Limited availability still remains for their Little Colonel ski program for age four to seven. Their six-week programs are a great way to learn to ski or snowboard with lift, lesson and rental packages at a huge discount – perfect for beginners. Not sure what to get your loved ones for the holidays, buy a gift certificate. Willard also offers holiday week ski or snowboard lessons – and holiday race camps for ages seven to 17 – on December 26-30 and February 20-24. The Willard Race Team is great for training and it’s affordable, competing in the Southern Vermont VARA in five age divisions, for ages under ten to 16 and older. Willard’s Freestyle Team teaches skiers fun maneuvers in moguls and aerials in a safe environment. Snowmaking has begun and the staff is eager to get the season going. Visit willardmountain.com. Just minutes from anywhere in the Capital Region, Maple Ski Ridge in Rotterdam has been celebrating family fun since 1963. It’s time to sign up for child or adult lesson programs that start January 2. They have weekend, after school, December vacation, walk-in group, private, women only and other affordable ski and snowboard packages available. Have your child spend the winter vacation with Maple Ski Ridge, their Winter Break Camp runs from December 26-30. Your kids will spend much of the days outside playing and exploring their winter wonderland. They offer gift certificates and a Value Pass for $89.99, which includes one free day pass, 20% off all 2016-17 future passes, and may also be used for tubing. They are now scheduling tubing parties for this winter. You can save 10% on lesson programs by using the “ASF16” coupon code. They’re on track for opening day on December 11. Visit mapleskiridge.com. In the central Adirondacks, McCauley Mountain in Old Forge, is big mountain fun, with small mountain attitude. McCauley’s 21 slopes, four lifts, and 633-foot vertical drop contains long cruisers, steep bumps and glades, and double black diamond challengers. Skiers moving out of the beginner ranks get a big bonus, as they offer accommodating trails from the summit. Annual snowfall is 280 inches, plus snowmaking and grooming, ensures good conditions for 100 days of skiing annually. Opening day is December 10 and special events include: Night Skiing on Playmate, Old Forge Winter Carnival, alpine and Nordic races, and much more. Their snowsports school has private and semi-private lessons and rentals. The McCauley Adventure programs develop great skiers for ages 4-6, 5-7 and 6-12 years old, with lesson dates from December 31 through March 4. Visit mccauleyny.com. 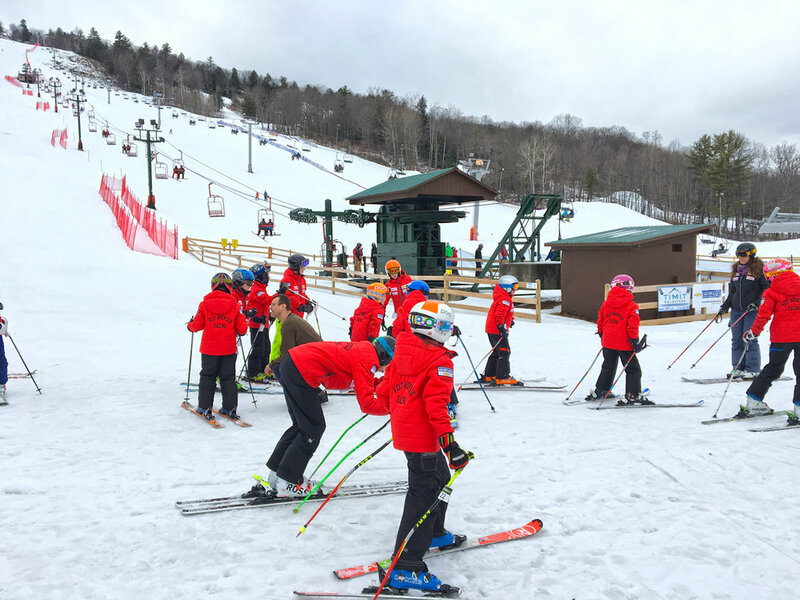 Don’t forget about the I SKI NY Free for Kids program for students in third and fourth grade. Kids can ski or ride at New York ski areas for free. A $26 processing fee and restrictions apply. For details, participating ski areas, snow conditions and more, visit iskiny.com.